Australia will draw on the lessons learned from Shane Warne's shock exit from the 2003 World Cup as they attempt to deal with the departure of Andrew Symonds on the eve of the World Twenty20. Ricky Ponting had barely commenced his international captaincy career when Warne, then at the height of his powers, tested positive for a banned diuretic and returned home from South Africa on the morning of Australia's opening match against Pakistan. On that occasion, Symonds blazed a tremendous century at the Wanderers to lift the spirits of the shell-shocked Australians and commence momentum that continued through to a victorious final against India. This time, others will be required to fill a void created by Symonds - he was ordered home following an alcohol-related incident during the week - and Ponting is confident he has the squad to cover. "I've been there before, I know how to handle it," Ponting said. "It's about the next guy in line coming in and putting his hand up when required and making a name and identity for himself at international level." Michael Clarke, Ponting's deputy, stressed on Friday that the recommendation of Australia's leadership group to send Symonds home was not personal, but was made with the interests of the team in mind. 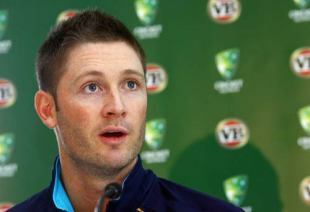 The leadership group - comprised of Ponting, Clarke, Tim Nielsen and Steve Bernard - felt Symonds' repeated behavioural infractions set a poor example for Australia's younger players, and decided accordingly to push for his removal from the World Twenty20. "It's certainly not personal, the decision was made for the benefit of the team and I think all of us are trying to move on and trying to focus on what's in front of us," Clarke said. "No matter what comes along on a tour, as a team you need to stick together and I think we've shown that. "We trained really well yesterday, I think our preparation today has been spot on, so the boys are looking forward to tomorrow's game and what's happened in the past will stay in the past."